Following the summer Canyoning plan at Omoshie School, “Mori no Akari”- a branch school, offers great midwinter activity plans. 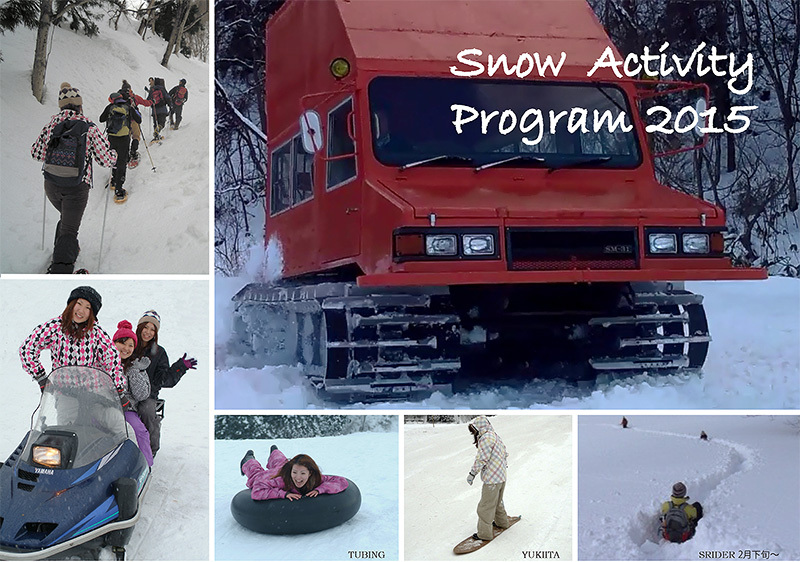 Snow tractor, Snowmobile, snowshoe hiking, Tubing and snow slider are activities that we would lie to guide you through. Snow trekking the mountains covered with a deep layer of snow wearing snowshoes is a popular activity. If you are in a mood for a ride in the deep snow, take a tour with our Snow tractor or snowmobile. Enjoy the winter with our special winter course! Open from January 10th to February 22nd. *Please make a reservation with a group larger than 2 people. *The participating people should be at least 18 years old and in good health. *Snowmobile riding is a tandem ride and your guide will drive it. *Snow tubing will be conducted depending on the weather conditions. * Injury insurance is included in the price. *One can change the course of snow trekking only. 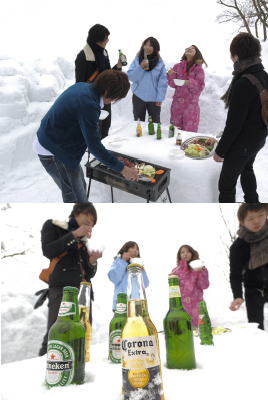 Enjoy a BBQ in the snow after the first half of the winter. Let’s go snow trekking and have a BBQ in the middle of nature and enjoy the early spring. * Please make a reservation with a group larger than 2 people. * The participating people should be at least 18 years old and in good health. * We also provide drinks with an additional cost. * Snow tubing will be conducted depending on the weather conditions. Every participant will receive a free CD with all the photos taken by the tour guide on that day. ski wear (jacket and trousers), boots or winter shoes, hat, gloves, bath tool, rucksack, etc. Please make sure to apply your registration by phone up to 5 days prior to your arrival. 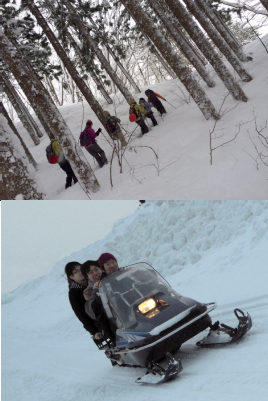 The guides will accept the registration according to the snow condition and the guide reservation status. These outdoor tours are made for you to enjoy nature but we might cancel or change the course in case of bad weather.